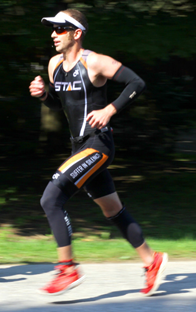 We are thrilled to welcome guest blogger, Andrew Buckrell, of STAC Performance, to the Team Infinit Blog. Andrew has his sights set on an Ironman in September - his first race at this distance. We will be taking you along his journey over the coming months so you can have an inside look at what preparation goes into becoming Ironman ready! I've always been interested in pushing myself to the limits, but after a near catastrophic (and very disappointing) first attempt at a 70.3 race, I had resigned myself to shorter race distances -- primarily sprint and olympic distance triathlons. I made all kinds of excuses: I sweat too much, I overheat too easily, and so on. While the allure of pushing yourself right to the ragged edge for a relatively short event is attractive, I still feel like I'm missing out on some of the magic of completing an IRONMAN length event. My mind was essentially made up for me while watching friend and professional triathlete Alex VanderLinden compete at the Mont-Tremblant Ironman last summer. Seeing the effort and dedication these athletes put into the event, not to mention the production and spectacle that WTC puts on, it elevated the race in my mind to a "life experience" status, rather than just another race. I was hooked on the idea. After convincing friends and family that it was, indeed, a good idea, and not just another crazy notion of mine, I realized that I needed to prepare my body in every way possible. I reached out to Alex VanderLinden for coaching duties, seeing as he was initially "responsible" for my ambitions, and at the same time I reached out to Darcy, CEO of Infinit Canada, for help with nutrition. After an initial phone consultation with Darcy, he educated me on the theories behind proper nutrition. This was, in no small part, responsible for my earlier 70.3 race failure. After helping me come up with a custom nutrition formulation, I was ready to start my training. I've always been a huge proponent of training exactly how you race, I knew that integrating proper nutrition into my training regimen was going to be a key to my IRONMAN success.